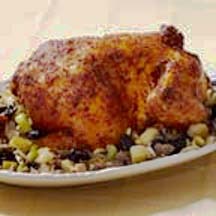 This intriguing, South American-style stuffed turkey features a gluten-free meat stuffing with onion, celery, green apple, slivered almonds and prunes. For Turkey: Rinse turkey and pat dry; set aside. Combine vinegar, bouillon, oil, oregano, garlic powder, onion powder, ground annatto seed and pepper in medium bowl. Mix well. Rub entire turkey including under the skin and cavity with paste. Refrigerate turkey for 24 hours. Preheat oven to 350°F (175°C); arrange oven rack to lowest position. Grease 13x9x2-inch baking dish. For Stuffing: Cook beef in large saucepan over medium-high heat, stirring frequently, until no longer pink. Add onion, garlic and ham. Cook, stirring frequently, for 5 minutes or until onion is tender. Add apples, celery, almonds, prunes and bouillon. Cook, stirring occasionally, for 5 to 7 minutes or until apples are tender. Fill turkey cavity with stuffing. Place turkey in prepared baking dish (reserve paste that has dripped off turkey). Arrange remaining stuffing around turkey; cover loosely with aluminum foil. Bake, brushing turkey with remaining paste every hour, for 3 to 3 1/2 hours or until thermometer inserted in thickest part of thigh registers 175°F (80°C). Remove foil for the last 30 minutes. Transfer turkey to platter and cover with foil. Let turkey stand for 10 minutes before carving.